Today’s WWE Old School review is a piece on one of the most important Summerslam events in history – Summerslam 1992, which is the only mainstream PPV event to ever be held outside of North America has it was held in London, England. WWE Summerslam 1992 was the “Summerslam we thought we would never see” because people didn’t realize that pay-per-view extended outside the United States…………hmm. The WWE did a strong job getting Wembley Stadium ready for the event, with the guys performing on the horns before the show started & almost making it look like a Manchester United game. Legion of Doom vs Money Inc.
During this period, the Legion of Doom (Road Warriors) were on their way off of their peak a bit, with this match being really their last big match in their prime in WWE. The team comes down on motorcycles & showed off why the Road Warriors were so big during the 80s & early in the 90s. 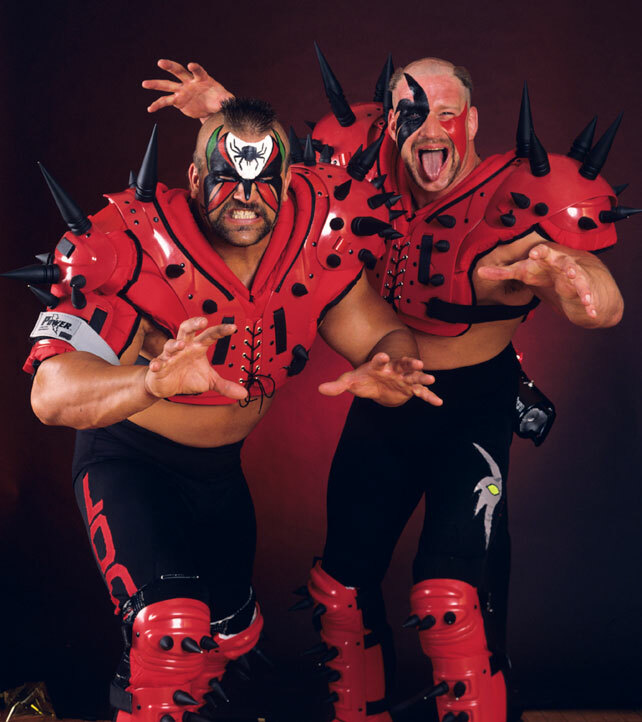 The Legion of Doom (Road Warriors) is one of the most legendary tag teams in the history of professional wrestling. Money Inc. was comprised of the Million Dollar Man Ted DiBiase & Irwin R. Schyster (IRS), whose real name is Mike Rotunda, who is the father of current WWE superstar Bray Wyatt. The match was a pretty standard match for the time. Legion of Doom gets an advantage for a minute, Money Inc., beats the hell out of Hawk from the LOD for about 6 minutes, Animal got the hot tag, & Animal slams DiBiase for the pin. The match itself was okay, but at the same time, it wasn’t supposed to be a 5-star classic. It gave the audience a chance to get amped up for the show & really get the crowd hot. So, this was an interesting match because the storyline going in was that both guys were going after HBK’s manager, Sensational Sherri, who was absolutely gorgeous at the time. She was one of the sexier women as a valet in the business & the guys knew it. So, of course, the guys were both wanting her & HBK was mad at Rick Martel because Martel would make passes at her & Sherri would smile if he came down to ringside to cause a little bit of trouble. Shawn Michaels vs Rick Martel at Summerslam 1992. The match at Summerslam would be that neither guy could hit each other in the face at all, which made for an interesting dynamic in that it showed off both of their wrestling abilities & showed what they can do with one of the oddest stipulations ever. While the match was technically very good, the story at the end was all kinds of wild. Sherri passes out on the apron, & Shawn leaves the match to go and carry her back & Rick Martel ran off to go get water & as Shawn has Sherri in his arms, Martel throws water right now Sherri, “reviving” her, leaving them both wet. Oh yeah, they finally got the face area at the end of it. Double countout. Odd match, but could have been much better if it wasn’t for the stupid storyline & stipulation in the match holding them back. 1992 was still during the time in the WWE where goofy characters & storylines were somehow getting over with the TV audience. The Undertaker had already made himself into an amazingly popular superstar who was only getting stronger as a performer & all-around entertainer at this time. Kamala had come in, beat up ‘Taker some & basically knew he could beat Taker, but only one small problem. You don’t keep the deadman down. Undertaker sat up, looked at Kamala, Kamala got scared & ran away like a girl. Taker wins by DQ. Lets get to some more important matches. Ultimate Warrior vs Macho Man Randy Savage for the WWE Championship – With Ric Flair & Mr. Perfect? This match had some unique circumstances going on, as well. The Ultimate Warrior & “Macho Man” Randy Savage were both thinking that Mr. Perfect was going to be in the other man’s corner for the match at Summerslam, so for weeks & weeks, Mr. Perfect courted both of them with each guy kinda hinting that maybe one guy would bend & have Perfect there, who was the manager for Ric Flair, who was soon to be on his way out of the company go to back to WCW. The Warrior was just coming back to WWE after making a surprise return at Wrestlemania VIII after a nasty money situation with Vince McMahon at Summerslam 1991, where Warrior wanted a big pay day to go out for the main event. Vince paid him, then suspended/fired him. He didn’t look like himself, had a weird singlet that no one really understood, & just didn’t seem to have the same fire as he had before. Quite possibly, Warrior’s two greatest matches were against Hulk Hogan at Wrestlemania VI & and against Savage at Wrestlemania VII the next year, so working against Savage in a high profile environment was a no-brainer here, especially with Randy Savage about to slow down a bit & knowing that he was going to go into the broadcasting booth for a while, replacing Jesse “The Body” Ventura & Roddy Piper – Piper who had just gone away for a bit, & Ventura had bolted for WCW. This was Savage’s second to last high profile match in the WWE, the last one would be against Crush at Wrestlemania X, afterwards, leaving for WCW. The match was a very strong one, nothing like their match from Wrestlemania VII, but strong nonetheless. The hook was when Ric Flair & Mr. Perfect came out, & we realized that Flair was the guy that Perfect was talking about always being in his corner, Savage & Warrior got up, chased off Flair & Perfect & they lived happily ever after. However, on September 1, a few days later, Flair beat Savage for the WWE Championship. At this point in the event, as a wrestling fan, I am incredibly underwhelmed with the card. WWE was at odds with WCW & during the late 80s into the mid 90’s, WCW had better overall wrestling from top to bottom, but the main event at Summerslam brought it all back in focus. This match didn’t need much hype for it, but it got a solid storyline in that the British Bulldog was legitimately Bret Hart’s brother-in-law due to marrying his sister, Diana. The WWE ran with that storyline & when we got to Summerslam, we saw one of the greatest wrestling matches in the WWE’s history. It was a true back & forth setup, telling the story of Bret’s technical ability with the Bulldog’s power & agility. It was a 30-minute classic & for it to be the main event of a pay-per-view over the world championship match showed that Vince had a lot of confidence in Bret & in Davey Boy to tear the house down, & they did. 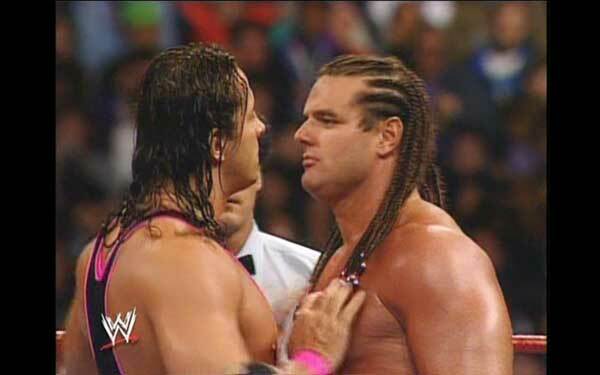 Bret Hart & British Bulldog had a classic match at Summerslam 1992. Bulldog won the match on his home soil & the crowd was all the way in for it. The atmosphere lit up for this matchup & it helped to salvage a lackluster event overall. If you are going to watch this on WWE Network, just watch the Warrior/Savage match & definitely Bret/Bulldog. The rest of the card was just terrible, to be honest.